About 5 miles south of Ton Duc Thang (or a 100,000 dong taxi ride) is a place called Binh Xuyen. You eat there, but it’s not like any restaurant I’ve ever seen. It’s a collection of long bamboo pavilions going zig-zag over 5 acres, maybe more, with stocked fish ponds in between them. You can rent a fishing pole, catch something, and they’ll cook it for you. The pavilions seem to go on forever. I never saw all of them; they must be able to seat a couple thousand people. Some are private one-family pavilions. The slanted coconut-leaf roofs are high and big fans move the air. There are lifelike plaster water buffaloes in the ponds. Wait staff ride bicycles and go on roller blades. Binh Xuyen has two locations, apparently. This one has been here “for a long time,” says Mark, who brought us here. His Vietnamese name is Tuan Nguyen. 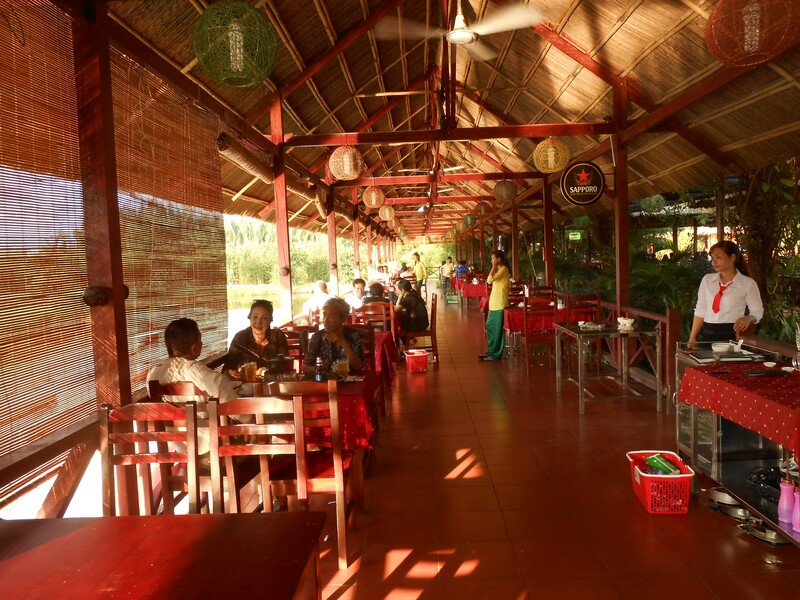 It is a traditional eating place that fills up on holidays and dates from back when the fish ponds used to flow into rice paddies. Now, along the divided boulevard that leads down here from the city, high rise apartments that will sell for $100,000 are sprouting up. 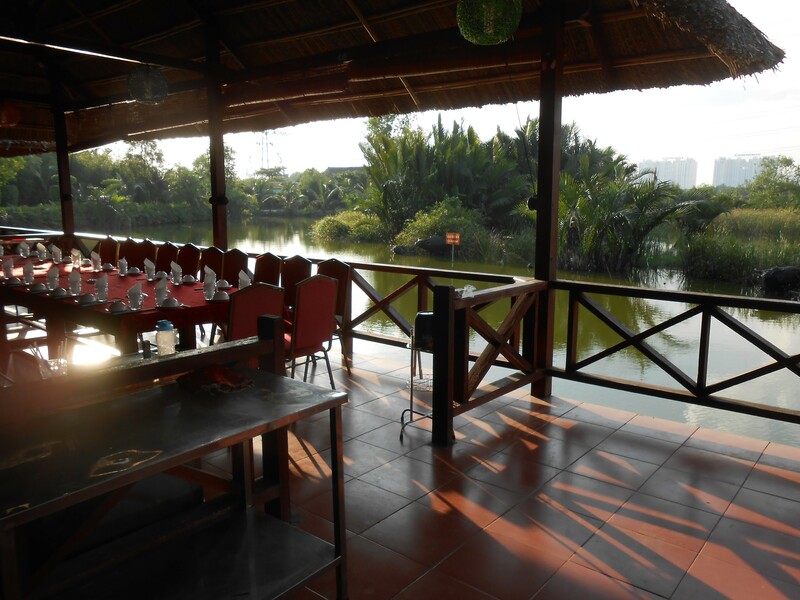 You look out over the fish ponds and the wetlands, and see construction. This is where the new South Saigon will be. Mark was born in Vietnam, moved to Houston with his family in 1995 when he was in eighth grade, and is now back in Vietnam to “be part of the new society”. He was introduced to us by Dean Hoa as someone who might be helpful with translating. He’s 34, has been here only ten days and has two jobs already, teaching English. In Texas he played keyboard in a Vietnamese pop band and toured Canada. At our request he asked the young woman who waited on us some questions about her working conditions. She made 3.5 million dong ($155) per month when she started; she now makes more like 4 million. Our meal cost 995,000, or a quarter of her month’s wages, just for comparison. She works from 8:30 am to 12:30, then has two hours off, and back to work until 9 pm. On Sundays she works a double shift (although how that can be, I don’t know). It’s seven days a week. If she doesn’t take either of her allotted two days off per month, she gets a 500,000 dong bonus. She gets one meal from the restaurant every day. She and her sister came from the country and share a room. She does not get paid at the legally required higher rate for working overtime. This is “the new society.” Although Mark was generally familiar with how people live here, he seemed shocked by this specific example. Joe and I have found that you can actually read the labor news, Lao Dong newspaper, published by the VGCL, , on line using Google translate. Negotiations are going on right now to raise the minimum wage. In fact, from what I can tell, it has happened. The Vietnam Chamber of Commerce opposes it, saying that 70% of all business in Ho Chi Minh City are not making a profit. Shall not exceed 8 hours per day or 48 hours per week (Hazardous work 6 hours per day). Article 106: Overtime work is work that takes place anytime outside of regular working hours. The pay for the young woman who waited on us at Binh Xuyen violates the labor code in several ways. For example, she works 7 days a week (7 x 8 = 56 hours) but does not get paid overtime for the hours above 48. It also looks as if she works 10 hours a day, not 8, even subtracting her two hour lunch break. So it’s 7 x 10 or 70 hours per week. Plus she does some night work. However, enforcement of the labor code is not something you count on. It takes a lot in any culture for dissatisfaction to rise to the level of a dispute. Workers have to get together and agree about what to do and at least threaten to use their leverage, which is always something collective involving their work, their “power at the point of production”. Pervasive violation of the labor code is something that you might think would do the trick. But once you see it and get together with other people and document it, what happens next? In some cases wildcat strikes, as have been common for the last 10 years here. (but seldom in retail or food service or tourism). How disputes get resolved and how resolutions get enforced is not laid out in the labor code. Instead, it just says that “the resolution of labour disputes shall be initially implemented” – meaning that the dispute shall get resolved, period. And then it says who does that. Item 5. The resolution of labour disputes shall be initially implemented through direct negotiation by the two parties to harmoniously resolve the interests of the two disputing parties in order to maintain the stability of the production, business and guarantee the public order and security. “Direct negotiation” can mean anything from one-on-one dialog between a worker representative and the employer to a mass meeting. It could be something that was decided on the spur of the moment, oral rather than written, and not precedent-setting. It could also be something formal and structured. The main thing is that in “direct negotiation” parties talk to each other: it is not indirect. Item 6. The resolution of the labour disputes shall be carried out by a competent agency, organization or individual when one of the two parties submits a request due to the fact that one of the two parties refuses to negotiated, or does not negotiate successfully, or negotiates successfully but reneges on the agreement. The ‘competent agency” is MOLISA, the Ministry of Labor, Invalids and Social Affairs. It can levy fines, but they are small compared to the money saved by the enterprise by not paying workers what they are due. Some companies simply consider it a cost of doing business. The law, in other words, is very specific and prescriptive about what the conditions of work ought to be. But the law does not establish a procedure that moves the situation from a violation of the law to a dispute about obeying it, to an agreement that it will be enforced and assurance that the violation will not happen again. If all else fails, the law does make provisions for going on strike legally, but those provisions are apparently so complex that this tactic is never used. Instead, you get these wildcat strikes. In our system the levels of actual enforcement (especially in the 90% of workplaces that are nonunion) are not actually much better than Viet Nam, unless workers take some collective action to bring attention to the condition. There is a path in our system through which both labor board violations and labor law violations can end up in Federal Court, but years go by while that process is grinding along. We have been asked to prepare a bargaining simulation exercise to be given to about 30 faculty and students next week. We have talked about how and if to try to make the enforcement issue part of the exercise. I am going to suggest that we try something else and stay away from enforcement.